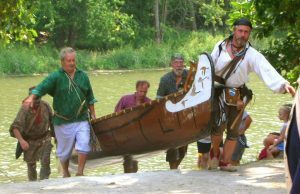 Join this festive gathering of fur trappers, settlers, craftsmen, and entertainers along the banks of the Des Plaines River at “A River Thru History – The Des Plaines Valley Rendezvous”. The Rendezvous will be held on September 7 and 8, 2019 – from 10am to 5pm (4pm on Sunday) at the Columbia Woods Forest Preserve in Willow Springs, Illinois. 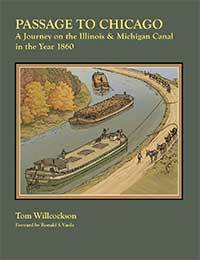 A River Thru History is a living history reenactment of early American life, as it was on the Illinois frontier prior to 1848, with emphasis on our local history from the fur trade era to the canal era. The goal of this rendezvous is to be the premier event of this type in this area by creating an exciting, entertaining and educational experience for all ages. To this end, we strive to create a better understanding and appreciation of our history by allowing the public and the reenactors to mingle, both as witnesses and participants, in our event. Finally, we seek to have the most authentic and highest quality reenactors and trade goods to represent our vision of the rendezvous. This is consistent with the overall goal of the Illinois and Michigan Canal National Heritage Corridor Civic Center Authority, which is to promote and enhance the historic, recreational and economic development of this new style National Park.